Comfortable furniture, soft lighting and a relaxed atmosphere resembling a quiet time at home is probably one of the last images that springs to mind when discussing where to send someone needing emergency treatment during a mental health crisis. But an initiative being developed by the mental health clinic of Schenectady, N.Y.-based health system Ellis Medicine will try to change traditional perceptions of how mental healthcare is delivered in a clinical setting by making its environment less clinical. By year-end, the clinic plans to open a new outpatient treatment facility based on a community model that experts say provides individuals experiencing a psychiatric episode with a better environment to receive treatment than a hospital emergency department. This “living room” concept has been around for a number of years. Nonmedical, community-based organizations traditionally run similar programs across the country free of charge. The Ellis model would serve as more of a hybrid of both the hospital and community settings that will offer the same type of relaxed setting as the community programs, but also offer patients access to clinical resources. Over the next year, the initiative hopes to track its effectiveness in diverting psychiatric patients from the ED and lowering their anxiety levels, according to Mary May, clinical manager at Ellis Mental Health Clinic. The Alliance for Better Health will fund the program's first year with a $420,000 grant awarded this month. The vast majority of “living room” programs are financed solely by donations and grants. But May said the Ellis program will be evaluated to see if there is potential of turning it into a billable service from public and private insurance. Doing so would help ensure the program's sustainability over the long term, and having the health system's support makes it more likely to succeed, she said. A number of these programs currently bill for some of their services, such as therapist consultations. But Ellis wants to bill for the entire program under some type of value-based payment model. The Ellis program would operate from noon to 8 p.m., and serve up to eight individuals a day for up to 1,500 visits over the course of a year. A nurse practitioner, mental health clinician, case manager and peer specialists from local community-based rehabilitation services provider, Rehabilitation Support Services, will staff the room. Patients will have access to counseling and social services assistances, or they can come in to calm themselves in a safe, comfortable environment and leave at any time. May said the “living room” concept was born out of a dearth of available options in the area for individuals experiencing a mental health crisis, other than visiting the ED. Experts say such settings can often exacerbate psychiatric patients' conditions and can escalate situations to the point that the patient or clinical staff could be in danger. “It's a chaotic place, and whenever you're suffering from a psychiatric emergency, stress and chaos are not going to make you feel better—it makes everything worse,” said Theresa Nguyen, vice president of policy and programs for Mental Health America. Nguyen said programs that encourage avoiding the ED for patients experiencing a psychiatric crisis are the optimal choice, but are still limited in scope. 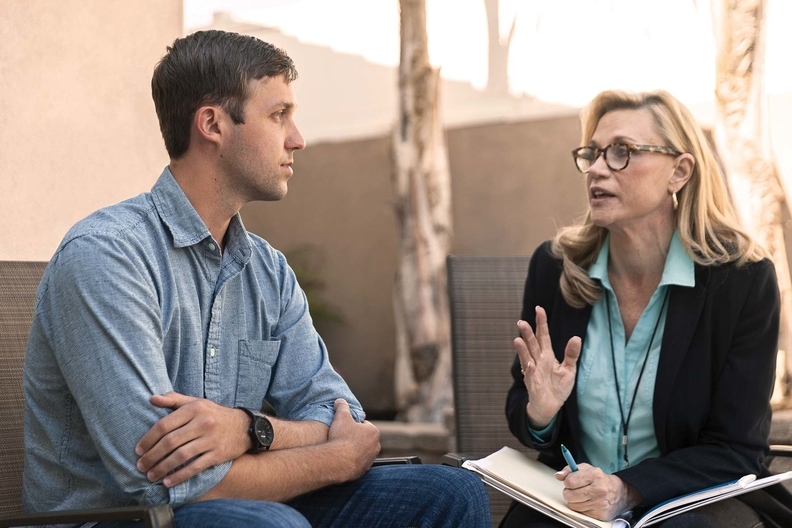 Although more healthcare providers have worked to improve primary-care delivery for psychiatric patients, advocates contend not enough is being done to offer a continuum of care where those who experience a psychiatric episode can get support well before it becomes a crisis. An estimated 800,000 ED visits occur each year involving a patient suffering from symptoms of schizophrenia, according to a 2017 report from the Treatment Advocacy Center. Approximately 1.5 million visits involve individuals experiencing problems associated with mood disorder. The report found only 1 in 5 patients with schizophrenia or mood disorders discharged from the ED were connected to follow-up support in 2015. Psychiatric patients wait an average of three times longer than other patients to be transferred to an inpatient bed, sometimes resulting in ED waits that can last days or even weeks. In addition to respite programs, efforts to find more upstream solutions have involved creating mental health urgent-care clinics, where individuals can walk in and obtain immediate assistance. In cities like Chicago, all 911 emergency dispatchers are required to undergo mental health awareness and de-escalation training in the hope that operators will better identify a mental health emergency and deploy proper resources, such as mobile mental health crisis teams. But while many urban areas have those supports, Nguyen said rural communities don't have similar access. A 2013 study published in the Global Journal of Community Psychology Practice examined the first year of operations of a similar community crisis respite initiative in Illinois. Visitors came to that program rather than an ED in 213 out of 228 visits, or a 93% deflection rate, and an estimated cost savings to the state of $550,000 since most were either on Medicaid or uninsured. May hopes the results of the yearlong pilot study will prove that the “living room” concept can be a model that could be adopted by other healthcare providers. “It's a very exciting time in healthcare, and we're really hoping that new ideas come out of this,” she said.